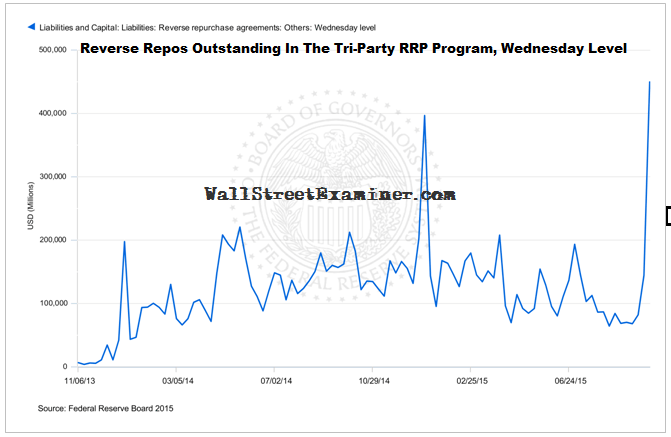 I regularly cover developments in the Fed’s ridiculous Reverse Repo (RRP) program in the MacroLiquidity Pro Trader Report. That short section of the report is normally just a mundane account of what went on in that useless program over the course of the week. I say that the program is useless because the Fed will almost certainly never use it for its supposed purpose. That purpose is to get interest rates to magically rise when the Fed decides it is time, at the same time that there are trillions of excess reserves in the banking system. If by some strange Kafkaesque plot twist, the Fed really does try it, there’s no way that it can work. That’s because paying banks more interest lowers their cost of funds, which is hardly an incentive for them to raise rates. That’s just the preamble for what I have to tell you here. There has been so much misinformation and gnashing of teeth in the financial blogosphere about the spike in the Fed’s RRPs outstanding last week, that I must set the record straight. The RRP spike is a non-event. The spike in RRPs is not evidence of a mushrooming financial catastrophe and crisis under way. It’s not that there isn’t a mushrooming financial crisis under way. There is. It’s just that last week’s RRP spike has absolutely nothing to do with it. It has to do with a Fed stupid parlor trick and the temporary shortage of short term T-bills along with the resulting excess of cash. Below is my coverage of the subject from the most recent weekly MacroLiquidity Report. The two salient facts are that the Fed regularly does two quarter end term repo operations that add to the end of quarter amounts outstanding. They are not a response to any market conditions. The Fed reveals in its FOMC meeting minutes and elsewhere that it instructs the NY Fed to conduct these quarter end operations. It has done so every quarter this year. The NY Fed posts a statement laying out the operations a few days in advance of the end of the quarter. The Fed holds daily overnight reverse repo operations. Over the past week, operations ranged in size from $75 billion to $199 billion on September 30 for end of quarter window dressing. Amounts outstanding have been in a downtrend all year, with the exception of those quarter end spikes. This chart shows the weekly outstanding as of the Wednesday statement. The reduction of T-bill supply due to the debt ceiling and lack of a budget deal (See Treasury update) has caused an uptick in RRPs outstanding this week. But the Fed did another round of quarter end term RRP operations with a 7 day offering of $100 billion September 24. It also did a $150 billion 2 day offering on September 30. That $250 billion showed up on the September 30 H41 statement as part of $449 billion outstanding. It will disappear this week. As of Tuesday, October 6, $130 billion was outstanding. Part of the spike was due to the fact that the Treasury paid down $62 billion in outstanding T-bills last week. In the game of Money Musical Chairs, the erstwhile holders of those T-bills were suddenly stuck with a mountain of cash with no place to sit it when the music stopped (obviously sitting some of it in the stock market chair). Oh,look! Grandma brought in an extra chair! The Fed’s RRP program! Let’s put the money there and show them on our balance sheet at the end of the quarter! That will look nice! The calendar also played a role in exaggerating the enormity of this spike. The Fed posts its H.4.1 weekly balance sheet data every Thursday as of the week ended on Wednesday. It just so happened that the end of the third quarter fell on Wednesday so that the peak outstanding RRPs were reported in the Fed’s weekly data. Don’t worry though. When the quarter doesn’t end on Wednesday, the Fed just extends the term of the extra repos by a couple of days so that they can show up in the bank’s weekly call report to the Fed. These guys are slick! What the weekly Fed statement and data did not show is that the amount outstanding the following day, October 1, dropped to $75 billion. That was at the low end of the amounts outstanding on a daily basis this year. Once the banks had shown the Fed RRPs on their quarter end statements, they were done with them. The Fed’s stupid parlor trick had served its purpose.